Benign mesothelioma is a rare, non-cancerous and treatable form of mesothelioma with a high survival rate. Benign mesothelioma is extremely rare and has four subtypes. The cause is unknown and can occur at any age. Benign mesothelioma is usually treated by surgery with a high success rate. Though easily treated, in some cases benign tumors may become malignant or recur. Unlike its common counterpart, malignant mesothelioma, benign mesothelioma is rarely deadly and easy to treat. About half of patients affected with the disease will experience symptoms, while the rest are asymptomatic. Secondary symptoms may occur if the benign tumors grow large enough to press on other organs and impede their function. Mesothelioma is classified as either benign or malignant. As implied by their names, benign mesothelioma is non-cancerous, while malignant mesothelioma is a hard-to-treat cancer. Cause, symptoms and treatment are all differentiating factors between the two forms of the diseases that can help a patient better understand his or her prognosis. What Causes Benign and Malignant Mesothelioma? When looking at the cause of malignant and benign mesothelioma, the majority of patients with malignant mesothelioma have a history of asbestos exposure. The benign form, however, has not been directly linked to asbestos exposure, and the exact cause remains unknown. Research continues to identify potential risk factors and warning signs that individuals can look out for to ensure detection as early as possible and therefore a wide range of treatment options. 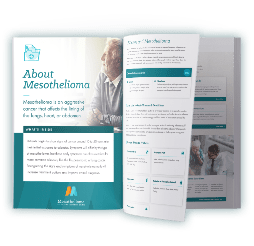 While malignant mesothelioma often has a 10 – 50 year latency period before symptoms appear, symptoms for benign mesothelioma can emerge at any time. Late detection of malignant symptoms often complicates diagnosis and can frequently lead to misdiagnoses. Patients experiencing symptoms of mesothelioma in any form should seek professional care as soon as possible. In general, symptoms of benign are often similar to those of malignant mesothelioma, though can vary greatly based on location, subtype and from patient-to-patient. Metastasis is a huge determining factor in predicting the course of mesothelioma. Spreading can greatly impact life expectancy and treatment options. The malignant form is known for metastasizing to nearby tissues, organs and lymph nodes. Benign mesothelioma, on the other hand, rarely affects other parts of the body, unless the benign tumor grows large enough to impede organ function. In addition to being non-cancerous, limited metastasis makes benign mesothelioma much easier to treat. Mesothelioma surgery is used for both curative and palliative purposes to remove tumors and help alleviate symptoms. Benign mesothelioma, unlike its malignant form, is treatable and has a low mortality rate. Benign tumors are typically addressed through surgical removal, and most patients make a full recovery and live a normal lifespan. Malignant mesothelioma has no known cure at this time with a poor prognosis, but treatments can extend and improve the lives of patients. There are four main subtypes of benign mesothelioma, though they account for far fewer cases than types of malignant mesothelioma. Benign mesothelioma affects the lining of cells around organs (mesothelium), and depending on subtype, can be found in different locations. Tumor location and cell structure help differentiate between subtypes and give physicians and patients a better understanding of how the disease may progress and respond to treatment. Each subtype has general defining characteristics, though each case may present differently. One benign mesothelioma subtype is benign multicystic peritoneal mesothelioma, also known as benign cystic mesothelioma. This subtype is characterized by numerous fluid-filled cysts and originates in the abdominal or pelvic cavity. As with all forms of benign mesothelioma, surgery is the main mode of treatment. However, for BMPM, there are other methods used to reduce the rate of recurrence, which can reach as high as 50%. Such methods include hyperthermic intraperitoneal chemotherapy and anti-estrogen therapy. Even with recurrence, it’s rare for these tumors to recur as malignant or untreatable. Well-differentiated papillary mesothelioma is a slow-growing subtype of benign mesothelioma that is often found incidentally during surgery or examination for other reasons. While it is usually benign, there have been cases where malignant mesothelial cells were also found within the tumor. Benign adenomatoid tumors are slow-growing and often cause no symptoms. However, some patients with a pleural benign adenomatoid tumor can experience localized chest pain. Discovery of most benign adenomatoid tumors is incidental on radiologic imaging or at the time of surgery for unrelated conditions. Based on accumulated case studies, it’s highly unlikely for adenomatoid tumors to recur or lead to malignancy. After complete excision, patients can typically expect to live a normal lifespan. Localized fibrous tumors are frequently referred to as LFT in literature. This benign form is also extremely rare and affects both men and women. Around half of reported cases have been asymptomatic, while others do have identifiable symptoms. The survival outcome of this subtype is very good following successful surgical resection. One report showed no recurrence after surgical resection in 100% of this subtype of benign tumor. Concern arises if tumors recur as malignant. Malignant solitary fibrous tumors of the pleura have a recurrence rate of 63%, even after full resections, and the majority of patients with recurrent malignant tumors die within two years. As mentioned previously, though benign, long-term monitoring is important to recognize any potential malignancies. General symptoms of benign mesothelioma can often resemble those of malignant. However, as noted above, frequency and type of symptoms can vary based on subtype. Benign subtypes may have additional symptoms that are not common for the cancerous form and could help lead to an accurate diagnosis. Many diagnoses of benign mesothelioma happen accidentally when physicians are addressing other conditions or diseases. In any case of mesothelioma, imaging tests are usually the first step to identifying the issue, and can include X-rays, CT scans and MRI scans. Doctors will also gather patient history to identify potential risk factors, asbestos exposure and current conditions. If a mass is identified, a biopsy of tumors cells will then be conducted to determine if a mesothelioma tumor is benign or malignant. Treatment is generally straight-froward for benign mesothelioma patients, consisting of curative surgery that fully removes the tumor. Surgery can have its own side effects, which patients will discuss with their physician. If a tumor recurs as malignant or has grown to a point of affecting other organs, there may be additional treatment options to alleviate symptoms or even palliative options as the patient recovers. Based on positive response to curative treatment, patients can typically expect a full recovery and unaffected life expectancy. Additional risk factors, malignant recurrence or existing health conditions may impact survival, so any individual facing a mesothelioma diagnosis may be subject to a different prognosis. For all cases, long-term monitoring is essential, and more research is necessary for further conclusive evidence, considering the rarity of these subtypes and lack of case studies. 1 Antman KH, Corson JM. Benign and malignant pleural mesothelioma. Clinics in Chest Medicine. 1985; 6(1): 127-140. 3 Butnor KJ, et al. Well-differentiated papillary mesothelioma. American Journal of Surgical Pathology. 2001; 25(10): 1304-1309. 6 England, DM, et al. Localized benign and malignant fibrous tumors of the pleura. A clinicopathologic review of 223 cases. American Journal of Surgical Pathology. 1989; 13(8): 640-658. 15 Sheng B, et al. Primary adenomatoid tumor of the testis: report of a case and review of literature. International Journal of Clinical & Experimental Pathology. 2015; 8(5): 5914-5918. Page last modified on July 27, 2018.